Vertical face strips for use on 5 and 10 foot Prozap® Bovi-Rub. Effective and economical control of face flies, horn flies, lice, and ticks on cattle and other livestock. Aids in reduction of pinkeye. Limits stock handling and reduces stress. 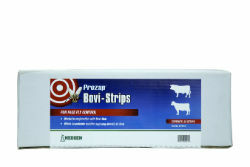 Simply tie the Prozap® Bovi-Strips to the Bovi-Rub for additional insecticide application to the face and sides of cattle and other livestock. Superior wicking action allows for low-stress application of insecticides.